Kaiji season 2 episode 22 ~ who will be blessed by fate? 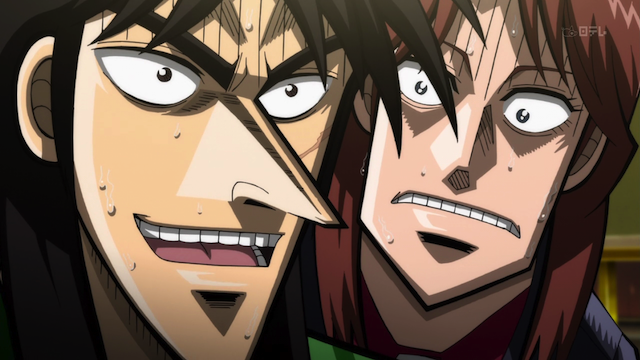 Kaiji and his moe-moe opponent, Ichijou. Kaiji continues his pachinko game, which means more head fakes, devious plans back-firing, and manly tears. Kaiji believes that, “even a fool or scum has a chance to win”. Now that Kaiji’s last trick has been exposed, is it all over? Truly this episode was intense, as it swung back and forth between Ichijou’s and Kaiji’s favor. And now we are at the final, final moment. Ichijou or Kaiji? Who will be blessed by fate? I love these anime. Keeps you on the edge and it’s amazing how exciting you can get watching gambling! I say that is what you call true storyline! I agree! Kaiji manages to keep the tension high. I never know quite what to expect.